Many companies come to dread the hiring process. According to the Society for Human Resource Management, it takes an average of 42 days and $4,129 to find the perfect match to fill one position. Full cycle recruiting seeks to streamline the hiring process and bring down the cost and time involved. Here’s what you need to know about using full cycle recruiting to make hiring a little less painful. Full cycle recruiting is, quite simply, the completion of the recruiting process by one person. The term is generally used in reference to a recruiter who completes all the steps of the recruiting cycle, from creating job descriptions to onboarding, as opposed to handing any steps off to a source or HR professional. Full cycle recruitment demands a diverse skillset and planning capabilities, as recruiters are responsible for a wide variety of tasks, such as collaborating with hiring managers, communicating with candidates, reviewing resumes, and even taking part in interviews. In addition to possessing strong communication and analytic skills, a full cycle recruiter must be able to keep track of the recruitment process. 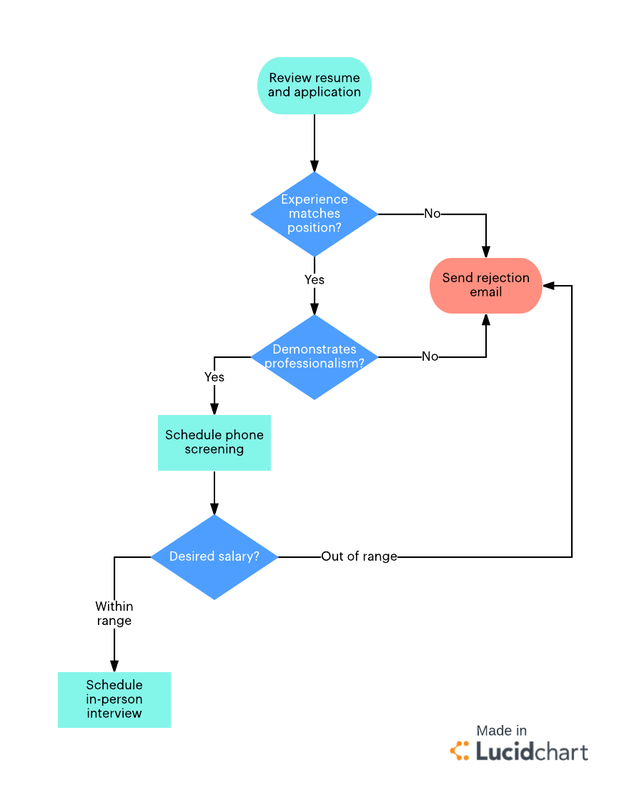 You can use Lucidchart to visualize this process—we’ll show you how. This initial step requires close collaboration with managers. Recruiters and managers work together to determine what a vacant role requires. Together, they’ll compile a list of ideal qualifications, differentiating between must-have and nice-to-have requirements. This list may include education, skills, and work experience. Once those requirements are defined, the recruiter will use that information to create a detailed job description. The recruiter takes the job description from step one and begins finding suitable candidates. Many times, this is as simple as posting the description on a general website for job seekers and waiting for applicants. Sometimes, however, the recruiter actively sources candidates. In sourcing candidates, a recruiter might use connections, headhunt from other companies, or look for potential applicants on business social networks. Once the recruiter has enough candidates, they begin looking at resumes, portfolios, and other application materials. The recruiter judges these materials against the job description created in step one. In most cases, candidates who do not meet the defined qualifications will be removed from consideration. The recruiter will analyze the remaining pool of applicants to create a short list—usually five or fewer candidates—to move forward in the hiring process. Lucidchart can help you standardize your recruiting process by tracking which qualities will move a candidate further in the process. Click to customize the template below. That short list of applicants enters the screening phase. This step can vary widely. Some recruiters may conduct an initial phone interview before arranging in-person interviews that include the hiring manager. Some companies may have several rounds of interviews, whereas other companies may need just one. Certain positions might necessitate skill assessments, such as a coding interview. As the recruiter and hiring manager work together to determine the best candidate, the recruiter will begin conducting background checks and checking references. By the end of this step, the recruiter and hiring manager should be prepared to extend an offer to a candidate. Once the final candidate is determined, the recruiter reaches out to the applicant and extends an offer of employment. Ideally, the candidate accepts the offer and the recruiter moves to the next step. Much of the time, however, the recruiter must negotiate terms of the job offer such as salary. Prior to extending the offer, the recruiter should have worked with the hiring manager to determine a salary ceiling, allowing the recruiter to effectively negotiate with the candidate. If all goes well, the recruiter and candidate agree on employment terms, and the recruiter proceeds to the final step. In this final step, the recruiter completes the onboarding process for new hires. This phase may include communicating with the new hire about benefits, training, and their first day. It also likely includes getting the new hire set up in the company’s computer systems and ensuring their manager is ready to receive them. By the end of this step, the new hire should be able to smoothly begin their new position, and the recruiter will have completed the hiring process in its entirety. Remember, these steps can be adapted to better suit your recruiting needs. You might, for example, want to break down the generalized “screening” step into a first interview, second interview, and background check. The most important part is to create a defined process that you stick to. In Lucidchart, you can easily customize your process with a flowchart and then share it with hiring managers, HR, or anyone else involved in the hiring process. The most significant benefit of full cycle recruiting is the accountability it creates. Because one person oversees the entire hiring process, there is no question as to who is responsible for any given step. Both successes and failures rest with the recruiter. Many recruiters report that this aspect of full cycle recruiting gives them a greater sense of control. They never have to fear losing a candidate due to someone else’s mistakes. The streamlined process gives them sole accountability. Candidates also benefit from full cycle recruiting, as they remain in communication with a single person throughout their interview and hiring process. This advantage alleviates concerns a candidate might have about falling through the cracks due to miscommunication between hiring personnel. It may also help the candidate develop more of a connection with their recruiter, making negotiations easier should the candidate receive an offer. Why use Lucidchart as part of full cycle recruiting? Full cycle recruiting streamlines the hiring process by putting the bulk of the responsibility on one qualified recruiter, eliminating communication disparities and preventing candidates from falling through the cracks. You can use Lucidchart to provide further clarity and accountability to your recruiting process. Use Lucidchart to map out every step of your custom hiring process. 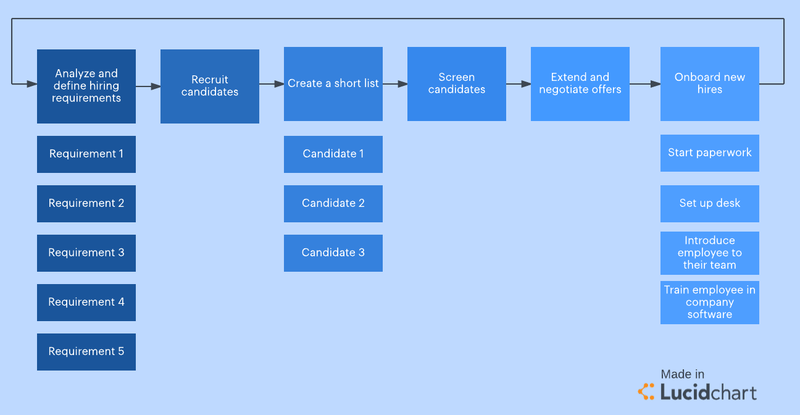 You can even create requirement flowcharts to help you decide which candidates should be shortlisted and which should be eliminated. 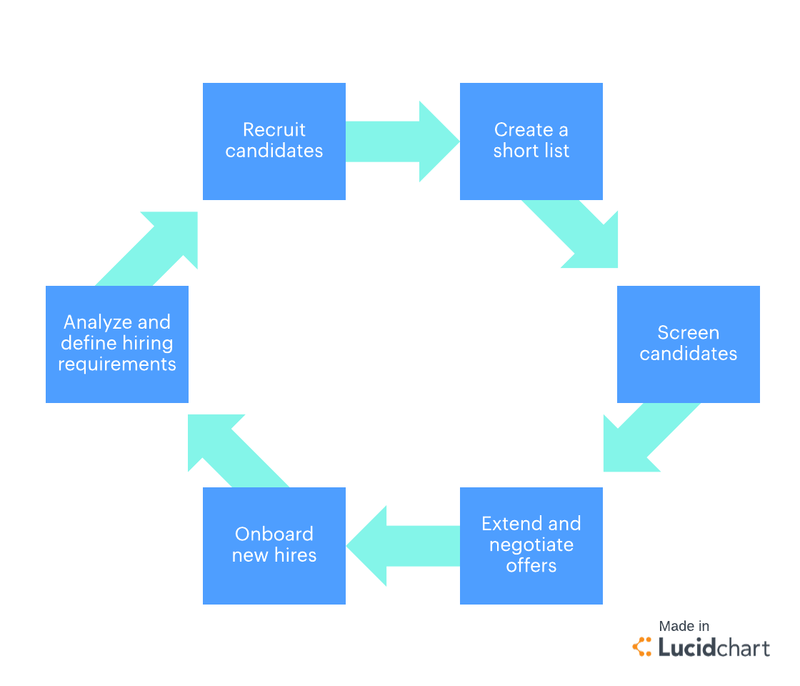 Lucidchart makes it easy to practice full cycle recruiting to simplify and standardize your hiring process.